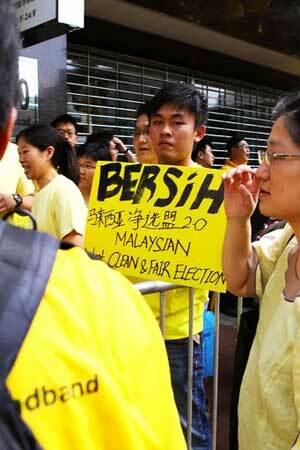 Born Again Malaysian, Totally Cleansed (BERSIH)! 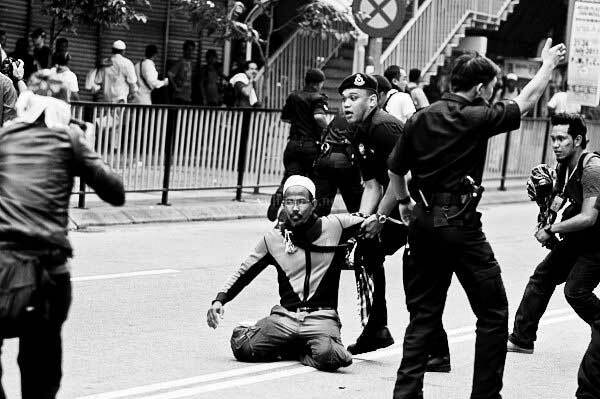 To put my participation in the BERSIH 2.0 Rally into proper perspective, I need to give you a short synopsis of who I am, and what I used to do for a living. 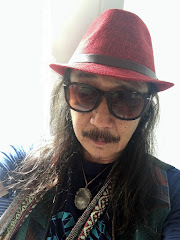 A full blooded Malaysian, I was born in the 50's in Kuala Lumpur, when life was simple, and as kids, we played amongst ourselves oblivious of whether we were Malay, Chinese, Indian, Eurasian, or others. We were just children and kawan-kawan, and we had a darn good time playing football, badminton, sepak takraw, picture cards, etc. all together then. Somehow all this changed especially after May 13, 1969. 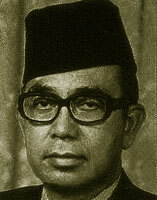 All the bigotry, and prejudice started to set in during Razak's time as PM and it slowly got worse and worse as the ruling elite spotted the opportunity to divide and rule, and make use of all the prejudice and bigotry to set up divide-and-rule systems that could be exploited to enrich themselves under the guise of "the Malay struggle." As time wore on, to further entrench themselves in their position of power, built on the insecurities of the masses, and the prejudice and bigotry spawned by their system of "divide and rule," they started to dismantle democracy in Malaysia by making the Executive (Govt) so powerful as to make the Legislature (Parliament), and Judiciary subservient to it, the Executive, thereby making the Prime Minister the de facto dictator of Malaysia. Not satisfied with this, they dismantled the jury system where we are supposed to be tried by our peers. No longer, now we are tried by judges who are on the government's salary, appointed by the government. 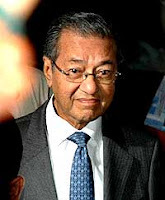 Furthermore, the government placed their staunch supporters in key positions, whether they were Malay, Chinese or Indian, in the AG's office, Election Commission, MACC, PDRM, and so on to control these institutions so that instead of doing their duty to protect and serve the Rakyat of Malaysia, they are now only to protect and serve the BN govt while paid and funded by the Rakyat. Naturally, by now, the whole election process in Malaysia has been corrupted and skewed to ensure government rule by the BN, where through gerrymandering, phantom voters, multiple voting, and manipulated postal votes, and the stuffing of ballot boxes, and outright vote buying guaranteed the survival of the BN government to the exclusion of all else, thus thwarting the Rakyat's Will. BERSIH 2.0 is the Rakyat's Rally to tell the BN Government that enough is enough and we want clean, free and fair elections to reflect the True Will of the Rakyat, and whoever wins the elections then, so be it. At my age, and having worked for 3 decades (since the 1980's) from a salesman all the way to a CEO of a foreign owned, public listed corporation, coming from a very sedentary lifestyle, the last thing on my mind would be to walk for hours in the afternoon heat, and with the threat of violence hanging over my head like the sword of Damocles, especially so when I suffer from high blood pressure (HBP), a bum left leg, and an overweight 115 kg body. Having lived through the BN apartheid system (yes, it is no different from South Africa's apartheid system under the whites before the ANC led by Nelson Mandela succeeded in making South Africa a truly democratic nation) for so many years, and having only been overseas for my tertiary degree for 3-4 years, and holidays paid for with my hard earned money, I have always worked in Malaysia, paying full Malaysian taxes, and contributing to the EPF, and lived here in KL all my life, I finally had enough when I saw the demonisation of BERSIH 2.0 and the true Patriots of Malaysia (steering committee of BERSIH 2.0 and all the 62 supporting NGOs), by this self-centred, bully of a government. So I told my wife and my kids that I had to go to this rally on the 9th July in KL and make our voices heard. If I made it back, fine, if I didn't, so be it. My wife wanted to walk with me, but I convinced her not to as our daughter is only 4+, though our sons are big enough, and she needed a parent to look after her. Also, if I didn't make it back, she needed to carry on the fight for the sake of our children, and for the sake of our country, Malaysia. This would be my first rally although I had attended almost all the PJ vigils to free Raja Petra Kamarudin from ISA and to mansuhkan ISA, along with my wife and family. My daughter was only 1+ yrs old then and she was then dubbed by Haris Ibrahim and Del Capo as the "Angel" Of the PJ vigils. Yes, I exposed my kids to all this because they had to be taught what is right and wrong, and that is the most important thing that I, as a parent, could teach them. 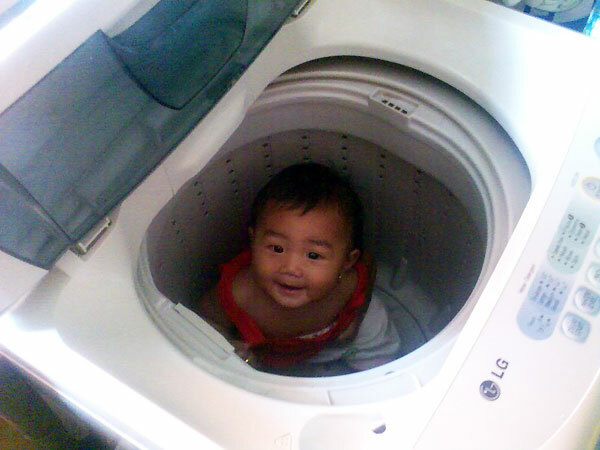 So we checked into Quality Hotel on Jln. Raja Laut as we thought we were going to the palace, then we heard that we were to go to Stadium Merdeka, but it was too late to cancel, so we all showed up at the hotel the afternoon before. On the morning of the 9th, I painfully hauled my 115 kg carcass up and walked out of the main door of the hotel at 9:55 a.m. with my wife who insisted on walking some way with me. There was a police car parked up at the front entrance, and further along we saw many blue "ants" milling around, maybe about 150 to 200 of them. We were stopped and asked where we were going, to which I replied:"Sogo". 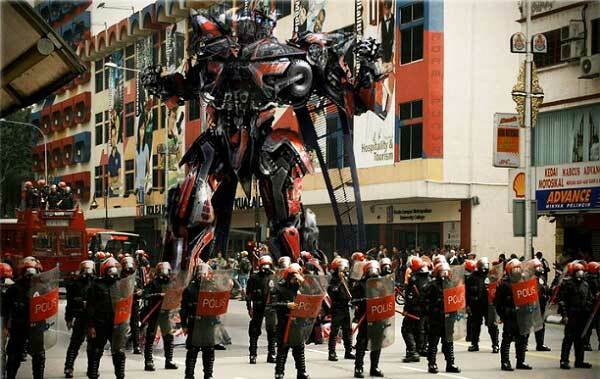 So this big burly policeman said:"Oh ... Sogo boleh." as if I needed his permission at all to set my foot in any part of MY country, Malaysia! We ignored him and went into Sogo for which could have been our last breakfast together. We observed them playing around with the red riot police helmets, batons, and shields while drinking our coffee. Then, at 10:20 am, we left Sogo and walked to the PRT station across the road. There were some policemen in the booking office and some milling around outside, so I looked at the train routes. I knew I should get out at Hang Tuah to be close to the Stadium, but I saw them watching me, so I told the gentleman at the counter, one ticket to Ampang (the last stop) please, and said goodbye to my wife with my eyes. You can tell that once the police heard me mention Ampang, they lost interest in me and what I was doing immediately, although I was carrying a bag of water, salt, extra t shirt and face towel! Luckily, we had such simple minded folk in the police force! I got on the train, but it skipped Hang Tuah station! I swore under my breath! 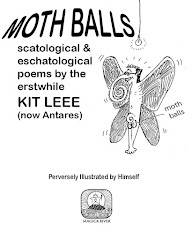 Will it stop at Pudu next, or won't it?? It stopped at Pudu, and I walked out, heading back towards KL. There were no police presence there at all, and while I was walking down Jln. Pudu slowly, the road was eerily quiet, save for some 5 or 6 other people walking like me. A little nervous, all alone on my way to my first rally, and cursing the Najib administration with every painful step of my bum left leg, hauling my 115 kg sweat drenched carcass, I stopped by a 7-Eleven and bought some sweets. The air-con made me want to just camp there, but the thought of my family floated across my mind, and with renewed vigour (as much as I could muster!) I headed down to where one of my friends said they would be, in McDonald's next to Kota Raya. Hii Tiong Huat from Sarawak was arrested one day before the rally for carrying this sign! But before that, I had to rest my bum leg again and I went into the Swiss Garden Hotel and ordered a milk shake to cool down while I texted like-minded friends to tell them that Jln. Pudu would be an all clear if anyone wanted to join the rally from this direction. When I reached McD's it was 12 noon and my friends, Lee, Chong and Menon were there laughing at my deplorable physical condition! Soon, we went out to Jln. Sultan and suddenly, everyone started walking out and chanting "Bersih, bersih", "Hidup Bersih", "Hidup Rakyat." 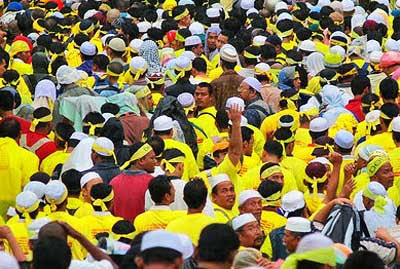 Young, old, strong, weak, infirm, the physically challenged, Muslims, Christians, Confucianists, Taoists, Buddhists, Hindus, Agnostics, Atheists, Malay, Chinese, Indians, Iban, and many more from all walks of life, walking together, shoulder to shoulder, with but a single purpose in mind, to reclaim our birthright to clean, free and fair elections in Malaysia. With adrenalin pumping, I walked the length of Jln. Sultan, and whenever a group made it to Kota Raya, we would walk all the way down clapping and chanting to welcome them, and then walk up again. We met several of our friends along the way, Rodi, Claire, Farid and his brother, Hawkeye Jack. There were a few Caucasian tourists joining in and cheering us on as well. What a carnival it was until ... without any warning to disperse, the police advanced upon us. 9 July 2011 was a truly Transforming experience! 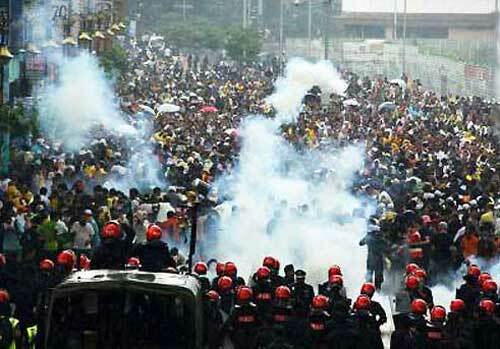 Before long, the tear gas came and the water cannon as well, just outside Menara Maybank and PuduRaya, while I was standing outside Nandos, and we scurried up into PuduRaya to escape from the fumes. The water cannon, however, ran out of water before it could reach us and had us jeering and laughing at the hapless "cannoneers", with tears streaming down our faces due to the tear gas! 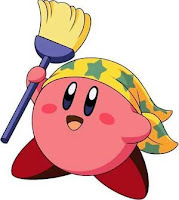 People were everywhere helping other people, regardless of race, religion, age, gender, etc., and offering salt, and one guy even got a hose connected to spray the people down, those soaked by the chemical laced water from the cannons, and those who got tear gassed badly. Nostalgia and euphoria simultaneously swept over me, as this was what it was like before May 13, 1969, and after Merdeka, all for one, and one for all! Malaysia had indeed come a long way since then, but here we are again, one people, one identity, One Malaysia! 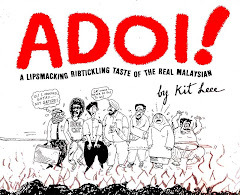 This is what the Najib character had tried to convince Malaysians the government of Malaysia is, but has instead shown how racist, fascist, and prejudiced they really are, administering an apartheid system of governance over the Malaysian people. God intervened at this point, and the resulting downpour washed away all the chemical laced water, and tear gas, and the police suddenly found themselves powerless to bully the protestors. 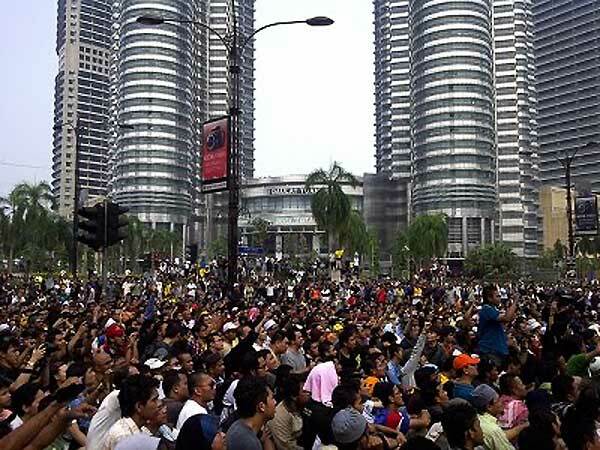 On the 9th July 2011, that was One Malaysia in action, and we all headed up Jln. Hang Jebat towards Stadium Merdeka. We stopped outside Stadium Merdeka on its access road and saw barbed wire across the road leading to the Stadium, with the cops behind it. Some of us shouted: "Kami sokong BERSIH, apa kamu sokong?? Kotor??" Some of them smiled. Some of us sat down and when 4:15 came, we dispersed as we, being men of honour, promised the Agong that we would, all of us, be melting away back to our mundane lives, from whence we came. There I was, with Lee and Chong, all drenched and soaked through from head to toe sitting outside the YWCA facing the Stadium when a friend of mine showed up, Lian, and her friend. An ice cream vendor came by and we waved him down and had some ice cream. Lee had also kindly shared his stash of biscuits with Chong and I. We parted company and I found out one of my friends had booked into the Olympic Hotel next to Wisma OCM, I dropped by dripping water as I entered the lobby. Cold, wet through, and still famished from no lunch, and my bum leg sore from so much walking and running, I managed to heave my 115 kg frame into a comfortable chair of the hotel cafe and proceeded to order lunch. 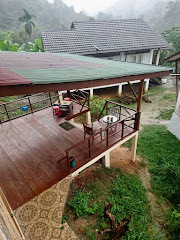 My friend, Pat, together with a PAS gentleman, Pak Lokman, had booked several rooms there, and I was generously given a room to shower, clean up, rest and recover. To cut a long story short, my wife and family came to fetch me from Olympic Hotel, and after one long look at my tired out countenance, my daughter held my arm tightly and kissed me on the cheek welcoming me back. We arrived back to our hotel and my kids offered to massage and pommel me and said thank you for fighting for them and their future. My wife was relieved beyond words that I made it without being worse for wear. I had left her with all my codes and passwords for everything the night before and I can never forget the look on her face when I did that. 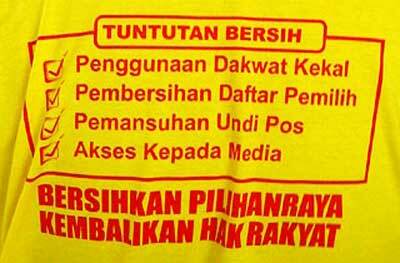 Najib, Hisham, Ibrahim Ali, Mahathir Mohamad, Muhyiddin Yassin, Muhkriz Mahathir, please take heed. 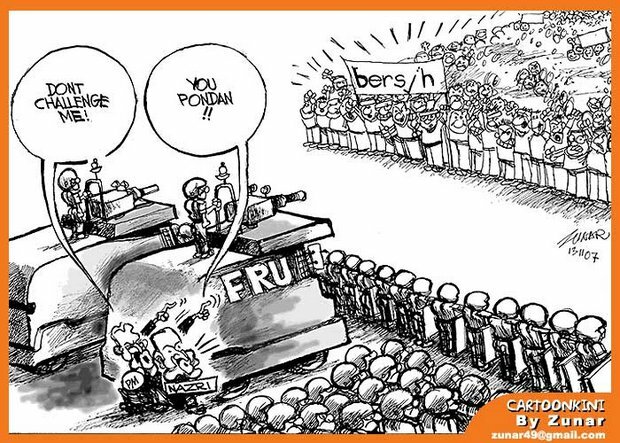 We, the Rakyat of Malaysia, will continue to fight for our civil liberties and rights under our Federal Constitution, and for electoral reform to ensure clean, free and fair elections, no matter what you do, or think you can do. With my passing, my wife and children will take up the clarion call to perform their duty as true patriots of Malaysia. Sure, I am rich enough to emigrate, but I choose not to as Malaysia is my country and my home and nobody, no matter how powerful, how evil, how scheming, will convince or blackball me, or my family and friends, otherwise. There is an ancient saying that we can die without a whimper, or we can make our deaths resound through history. Either way, we die, as death is a fact of Life. I have chosen to make my death count, for my country Malaysia. 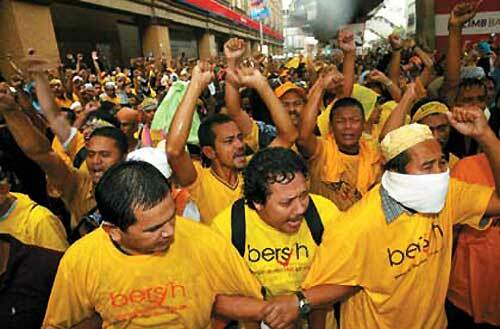 To the Death, lawan tetap lawan, if that is what is needed to reclaim our birthrights! An Ordinary, Sedentary, Risen through the ranks, Middle Class, Middle Aged, Bespectacled Malaysian with a bum leg, and an overweight 115 kg frame, signing off. Wow!! What a wonderful post!!! 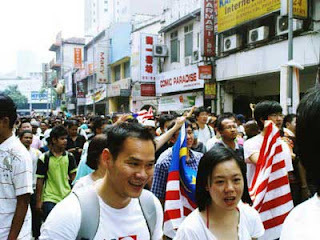 Thank you so much for sharing and more importantly, for caring enough to march for Malaysia! man, i feel your pain! glad that you have contributed so much.